The development of economics changed dramatically during the twentieth century with the emergence of econometrics, macroeconomics and a more scientific approach in general. One of the key individuals in the transformation of economics was Ragnar Frisch, professor at the University of Oslo and the first Nobel Laureate in economics in 1969. He was a co-founder of the Econometric Society in 1930 (after having coined the word econometrics in 1926) and edited the journal Econometrics for twenty-two years. The discovery of the manuscripts of a series of eight lectures given by Frisch at the Henri Poincaré Institute in March–April 1933 on The Problems and Methods of Econometrics will enable economists to more fully understand his overall vision of econometrics. 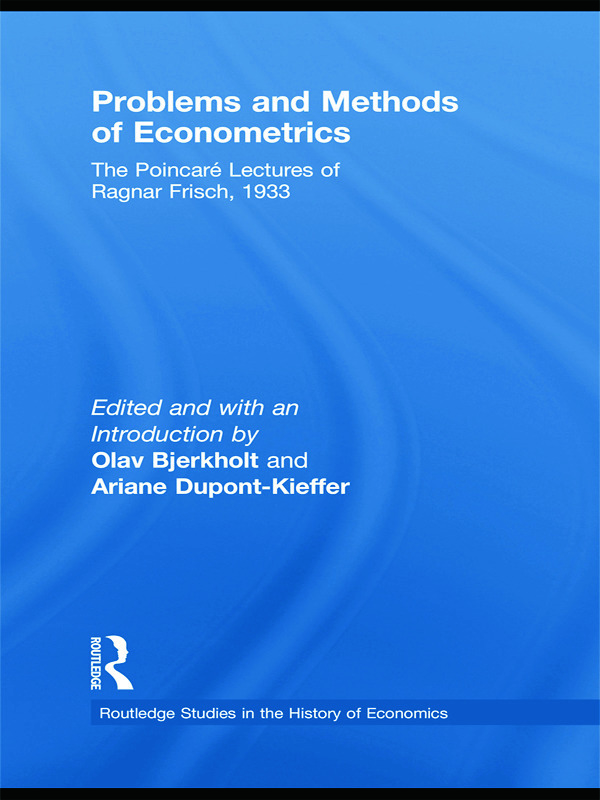 This book is a rare exhibition of Frisch’s overview on econometrics and is published here in English for the first time. Edited and with an introduction by Olav Bjerkholt and Ariane Dupont-Kieffer, Frisch’s eight lectures provide an accessible and astute discussion of econometric issues from philosophical foundations to practical procedures. Concerning the development of economics in the twentieth century and the broader visions about economic science in general and econometrics in particular held by Ragnar Frisch, this book will appeal to anyone with an interest in the history of economics and econometrics. The philosophical foundations of econometrics. The axiomatic method. Utility as quantity. What is a dynamic theory? Properties of determined and indetermined systems. Examples of dynamic econometric theories. Oscillations in closed systems. The theory of crises. The creation of cycles by random shocks. Synthesis between a probabilistic point of view and the point of view of deterministic dynamic laws. Statistical construction of econometric functions. Autonomous and confluent equations. The danger of analysis of many variables. Time series techniques. Decomposition of series. Linear operations and their inversion problem. Conclusion: The significance of social and mechanical laws. Invariance and rigidity. Remarks on a philosophy of chaos.